At the end of May, 2015, our son, Nathan, was in a tragic automobile accident, shattering his C6 and C7 vertebrae. He spent almost 2 months in the Ohio State University Wexner Medical Center, SICU. There came a time when his father had to return to work, so he would work long hours and then travel back to be with Nathan. Once Nathan was in a more stable condition, I would attempt to make trips home. Around that time, we were told about New Perspective Foundation. It was a great comfort to know that we were not alone and the support provided for travel needs helped so we could remain close to our son. Thank you, New Perspective Foundation, for your sincere interest and care in providing support to us and those with similar burdens. We are so very thankful we have not gone through this alone. My husband broke his C-6 in a pool accident on July 4th. He had several surgeries and was then transferred to the Shepherd Center in Atlanta, Georgia. Since we live in Pensacola, Florida, expenses added up quickly after taking several trips back and forth. New Perspective Foundation helped us with gas cards. It is so nice to know this organization is there is your time of need! Thank you for the help, New Perspective Foundation! You live your life never expecting the severity of an accident. When it does you become lost in a whirlwind of the unknown. Life changes and you become surrounded by things that are unfamiliar. You try your best to keep ahead of the rolling ball, but it always seems overwhelming. Never would I have anticipated my 22 year old daughter, Rebecca, to be in a wheelchair with a C-5 spinal cord injury. She is on a very long road to recovery and through it all is keeping a positive attitude. I want to take this opportunity to thank New Perspective Foundation for being able to help us get Rebecca's dad up to Atlanta so we could bring her home to Florida for continued therapy. She has been gone for close to 4 months and the foundation was gracious enough to provide the gas card we needed to alleviate some of our incurred expenses. It's amazing to know we are not alone on this new path and appreciate the kindness of New Perspective Foundation. I have enjoyed the comforting emails and phone calls and hope to continue our new friendship. My husband Michael, who was very active, including being a runner, fell in April injuring his neck and was paralyzed form the neck down. He was hospitalized for many weeks. Michael recently had to have surgery 250 miles away and will possibly need future surgeries. Michael will also be receiving therapy and follow-up care for months. While sitting in the hospital by Michael's side, I found New Perspective Foundation and since then, they have been a great inspiration and support. New Perspective Foundation has given me strength and hope and I want to thank them so much for their great support through this very difficult time. My husband, Ron, is an athletic director in Fort Walton Beach, Florida. On January 12, 2015, while at work, Ron fell in a freak accident that resulted in him being paralyzed from the neck down. Ron has been at the Shepherd Center in Atlanta, GA since January 23rd recovering and receiving extensive therapy. We are forever grateful for New Perspective Foundation for helping to alleviate some of my costly hotel bills so I can be by Ron's side through our journey to our new normal. Hello, my name is Kathryn and I would like to first say a very warm thank you to New Perspective Foundation for taking interest in my son and his tragedy. My son, Keith, who I call Lil' Keith, was a victim of a horrible crime while vacationing in Atlanta, Georgia on March 30, 2015. 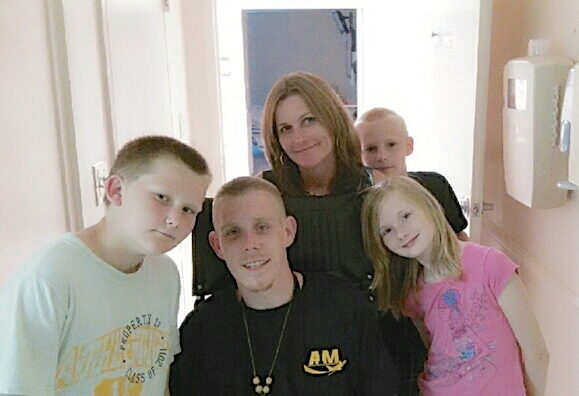 He was assaulted during an attempted robbery, which has left him a paraplegic. This incident has totally changed our lives in so many ways. Not only does my son have to learn how to live again and take care of himself, but he is mentally dealing with the incident and how he can't go back to life the way it was. I am a single parent and on disability due to medical issues of my own and Lil' Keith's father passed away a few years ago now. We thank God because New Perspective Foundation touched my son's heart at a time when he was thinking he could not go on. This foundation showed us there are others in our situation, and with help, we can get through this! I've visited my son daily (except 4 days) since January 26th and exhausted all my savings. I have been behind on bills due to the accident and expenses. I'm thankful that I was able to reach out to New Perspective Foundation; I didn't know any services like this existed.